With the stress of holidays around the corner, KnowBe4, the provider of the world’s largest security awareness training and simulated phishing platform, is offering up tips for staying safe while you travel with a free video module entitled “Safe Travels for Road Warriors.” The video, which is packed with online safety tips, is available now and will continue to be accessible throughout the 2018 holiday season. The 12-minute video for holiday travelers contains tips that are good for year-round safety. The animated video training course reminds viewers of the latest security threats for the modern traveler. Some of these tips include utilizing your own phone as a WiFi hot spot, avoiding public power sources to prevent hijacking of your laptop, how to prepare your laptop and cell phones for travel and more. In a digital security survey conducted by ObserveIT, it was found that a little over three quarters (77 percent) of workers say they connect to free or public WiFi while traveling. And surprisingly, 63 percent will use public WiFi to access work emails and files, many of which contain confidential information. 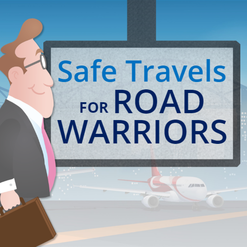 To download the “Safe Travels for Road Warriors” video module, please click here.